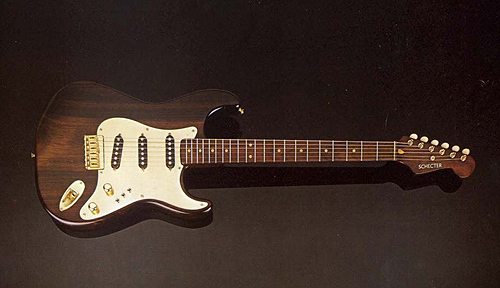 In the 80ies, Mark Knopfler was probably the most famous user of Schecter guitars. He bought several Schecters in 1980 at Rudy’s Music Stop in New York, mainly because he was looking for a guitar that was easier to play and better suited for the high demands on the road than the vintage Fenders he played before. Also his former girl-friend played a Schecter which he said was much better than his Fender guitars. So what was the story behind the Schecter company? Schecter Guitar Research started around 1976 in Van Nuys, California, when David Schecter opened his repair and custom guitar shop. He soon started to produce his own quality guitar parts which were intended to replace some stock parts on common guitars. Especially the Fender Stratocaster and Telecaster were the ideal guitar to be hot-rodded, since all their parts could be replaced much easier than with the laminated constructions that Gibson used, and the quality of Fender guitars was possibly at the lowest in the Fender history. Unlike Fender who build their guitars from rather common woods (ash, elder, maple,..), Schecter specialized in beautiful exotic woods, like Shedua, Koa, Cocobola, Pau Fero, Mahogany, Rosewood, Purple Heart, or figured maple (necks), or Red Oak, Paduak, Zebrawood, Teak, Koa, Anjico, Imbuya, and many more (bodies). As you see, trading with protected tropical woods was not an issue in the 70ies yet. 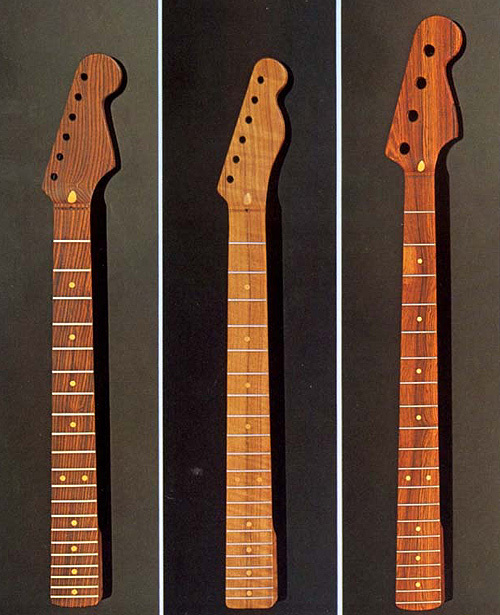 All necks were one-piece which means they did not have a separate fingerboard (as Mark Knopfler’s red Tele had, but this was a very late model). They had 21 frets, 22 frets were a later trend started by heavy metal guitarists in the 80ies. If you upgraded your guitar with such a beautiful exotic wood, you don’t want to hide it behind a solid finish, consequently the typical Schecter guitar was bare wood, or an oil finish, although laquer was offered for additional charge. In the seventies it was common believe that a guitar should ideally be rather heavy in order to have a lot of sustain. Surprisingly today many players prefer light-weighted woods, and talk rather about tone than sustain. One way to improve sustain – which means how long a note will last – was to replace the steel hardware with brass hardware. For this reason not only Schecter but also Mighty Mite – the second big parts supplier – and Fender themselves offered brass hardware as an upgrade in the late 70ies. 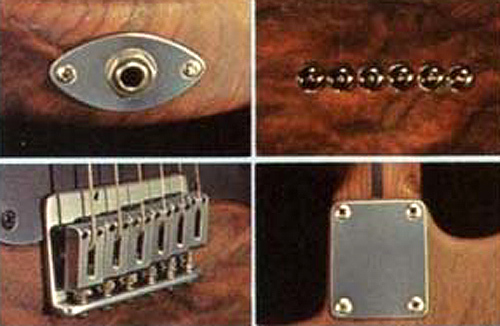 Fender even released an upgraded Stratocaster with the model name The Strat in 1980 that came with a brass bridge, a brass nut, and matching brass knobs. By the way, Schecter also supplied the big manufactureres like Fender and Gibson with parts, so possibly some of the brass master series parts by Fender were actually produced by Schecter. In the 70ies, there were hardly any high-gain amps, again something that was more a child of the 80ies. Nevertheless, the first amp manufacturers or amp repair specialists were successful with offering high-gain mods, e.g. the first Mesa Boogies based on a Fender circuit that was modified to have more distortion. Another way to increase the distortion abilities was to replace the stock Fender pick-ups with overwound pick-ups. This was what DiMarzio started in the early 70ies. Instead of the common 7,000-8,000 windings you simply put much more on a Stratocaster pick-up. This way the pick-up became louder and had less treble but more mids. The drawback: you would loose the original Strat sound which was great for clear sounds. Here David Schecter came in with the invention of the F500T pick-up, the first successful tapped pick-up. 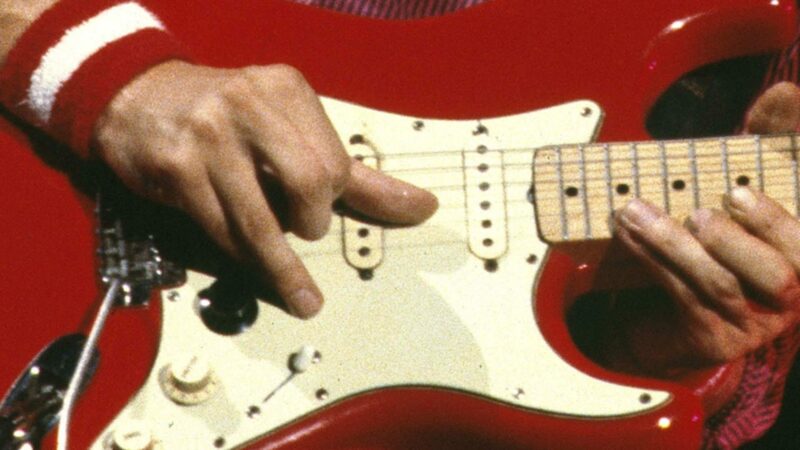 Tapped means that the F500T was a beefed-up pick-up with almost twice as much windings than a standard Fender pick-up, but it had a tap after the normal number of windings, so you could “switch off” the second half of the coil so to say. For this reason the pick-up did not have the normal two cables but three (ground, half coil, full coil). The pick-up coils were switched by three mini switches with three positions each (tapped, off, full), instead of the Fender 5-way switch. 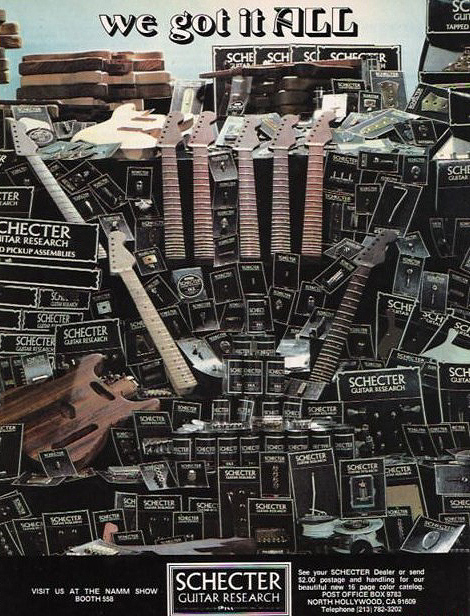 After a few years Schecter was very successful and their product range had grown so that they actually had each part of a Fender guitar in their catalogue. So it was nothing but the next logical step to offer complete guitars. These were put together by one of their qualified retailers (e.g. Rudy’s Music Stop was one of them), and marketed as Dream Machines. The five Strats (red, red, blue, sunburst, plus replacement sunburst) and the black Tele were Dream Machines. The red Tele as well, but he got this about 3 or 4 years later. Some more detail difference between a dream machine and a stock Fender (except the points mentioned above): two strap pins at the bottom (Schecters were often heavy, and this way the player could change the balance by using one or the other pin), metal pickguards, only two knobs (one volume, one tone), treble-bleed capacitor to reduce treble loss when reducing volume (similar to the telecaster circuit), two long-life plastic conductor potis, and sometimes no fingeboard dots. “They basically write contracts to people that wanna save money on their meat purchases, by buying 1/2 a cow, and getting the cut and packed into convenient sizes. Don’t have a freezer big enough? They’ll sell you a freezer too, just sign the contract. Then they sell the contract to a finance company. If they get too many complaints, they simply move their operation to another county or another state. Apparently, Shel didn’t use their investment money very wisely, and the meat-packers were getting pissed. I don’t know whether it was before, during, or after this problem, but at some point, Dave [Schecter] decided he had enough and split (or was forced out; that part is still unclear to me), leaving the company in Shel’s hands. At some point the meat-packing investors decided that they had had enough, too. So according to this source, the whole Schecter Californian shop was robbed out and the inventory sold from Dallas. This would explain why the Dallas era guitars still have many identical parts while other parts seem to be from other sources, and the overall quality was lacking. Later the name Schecter was sold to a Japanese investor who moved back the company to California. 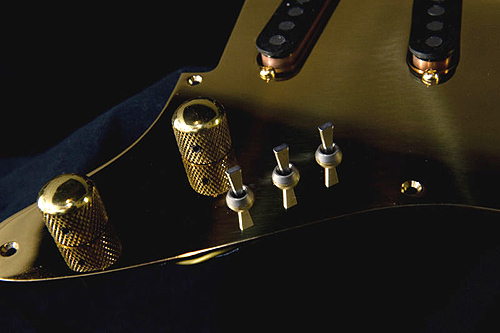 The new Schecter company made many original models,aiming mainly at the heavy metal scene. It seems besides the name this company has nothing to do with the original Schecter company. Well written, but I thought you were not very interested in vintage Schecters? I’ve been searching for a good old Schecter strat, but eventually gave up, they are too rare and when you find one, it’s overpriced imo. They are fantastic guitars, but I think old vintage Fenders are relatively a better investment and easier to find. Maybe I’ll once buy Rudy Pensa’s copy of the Dream Machine (MK80) but I doubt it will feel the same as an old Schecter. For those who are interested in Van Nuys Schecters, check out http://www.schecterforum.com/viewforum.php?f=20&sid=42f5145f580066c4457a3c895be84cc4 for more info. I have a Schecter strat, that seems to be ’57 repro. I bought it used in ’82. It’s black, with single-ply white guard (8-hole). What’s a good price? I might sell. Anyway something that will never change: Schecter always ruled and will rules forever.Period. Hi zado. I havo to correct you. Here in italy there’s THE schecter, the one Ingo reviewed. It belongs to a famous guitar player. You can find more info and the actual pictures on his facebook page. This information is not correct. The sunburst Schecter that belonged to Mark for many years belongs to a collector now, and he has no facebook page at all. It is still where it was when I had the honour to play it some years ago. on his facebook page, this italian guitarist shows a pic of the dream machine (and it looks Mark’s ex guitar, even on scratches) and he even says it is that actual guitar. Indeed! Dodi Battaglia’s Schecter is not MK’s sunburst Schecter, or, at least, not the sunburst “we” know; just take a look about jack socket position and no dots on fretboard (as usual on Mark’s Schecters). Is it possible for you to tell me, if we have a Schecter Dream Machine? The owner is my father in law. She had the two strap pins, 3 Potis (2 of them are Push/Pull), 2 Humbuckers and a “no dot” neck. The seller in the 80’s said, she was build in a series of five Guitars and it was the only model sold in Germany. Schecter has a really long and interesting history. I didn’t know all that, so thanks a lot fot this article! We wont sell this Guitar. I just wanted to know the Model. Its hard for me. Im lefthanded an everyday I see this great Guitar an i cant play on it..
Of course Doyle Bramhall II, Albert King or Otis Rush didn’t invert the strings, they played with the strings reversed (ie the thin E on the top), but most of left handed guitarists play “normally” by invert the strings like Hendrix, Mc Cartney and so on.., so it’s not a problem for a left-handed player to play on a right-handed guitar. Mark Knopfler is left handed and he plays right hand ?? Does any body know the neck shape and size of the MKs CAR Dream Machine guitars? They look really thin in the videos! Possibly you are right and it is rather slim but unless you can get your hands on his guitar you will not know any measurements for sure. Today he likes fatter necks better, one reason he uses some of his previous guitars less, e.g. his first Pensa/Suhrs. If anyone wants to know the details on Marks Main CAR Schecter Dream Machine I have pretty much all the details from Tom Anderson himself. Dave was forced out by Shel and Hershcel. They sunk their teeth into Schecter AND Charvel during 1977. They tried to bust Wayne Charvel, but Grover Jackson came along and screwed up their plans. I have a very early dream machine made out of paduak. The neck is not too thin and not too fat it’s just right. Nicest strat I ever played! Hi my name is Jim Jepson I met Dave when he first moved out here from Boston, I repaired guitars in a store in Reseda, CA called Harmony Music from 1971 to 1980. I repaired guitars for Norm Harris when he had just moved out from Miami..I knew pretty much everyone. Wayne Charvel was refinishing for Fender at his house and went by the name Johnny Diamond a stage name.. I met Seymour Duncan when he first moved back from Fender Soundhouse in England..Randy Zacutto of Mighty Mite.. Tom Anderson of Anderson Guitars was taking lessons at Harmony Music and then went to work for Dave. I want a history lesson! Dave and my dad Bud Hartman became friends around 1990. Dave had a little place in the desert off hwy 138. He and my dad built a guitar or rather my dad did with Daves guidance that I still have. Dad passed about 3 years ago. Dave was A cool guy while I knew him and my dad enjoyed his company. The pick ups on this guitar I have always found amazing. Nothing technical to add, just glad I got a chance to meet and be around him and my dad while they gadgeted around. I have a Fender strat (1977) with what appears to be a Schecter pickguard. As far as I know it was bought in this configuration. I inherited this guitar (actually I married into this guitar, it was my wife’s, first husband’s, stage guitar). It was bought around 1980 (+/-). I have pics, and I can dismount the pickguard to get shots of the back side, if you would like. I would like to know more about this axe, and general values, not that I’m planning to sell it. read this website, and I used to visit this blog every day. As the potis had been replaced years ago can someone tell me what the precise name and specifications of original potis would be? Bourns 82A1DB28BA0186 (“blue box”) should be fine. Hi. I have a schecter bass with number A0080 serial. Wondering if it is a Van Nuys! How would I figure out? Thx! Hi. I buy a Schecter ( White strat). The nr on the backplate is 0218. Can sombody tell me something on this guitar i wil be happy. Cam anyone give me some info?